1. 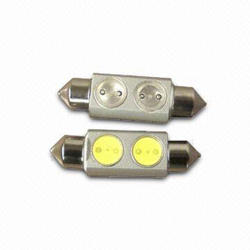 Automotive LED bulb with built-in current limiting resistors, used for illumination. 7. Long lifespan: >50,000 hours. 1. Base type: SZ39. 2. Power: 1/ 2W. 3. Supply voltage: 12V DC. 4. Luminous flux: 40/ 80lm. 5. Emitting angle: 180°. 6. Color: R /Y/ B/ B/ W. 7. Material: aluminum. 8. Net weight: 13g/ pc. 9. Packing: plastic shell or static-free. 10. Colors available: white, red, yellow, blue, and green. 11. Applications: (1) Auto or aircraft. (2) Auto signal. (3) Recreation vehicles. (4) Trucks or trailers. (5) Marine or boats. (6) Motorbikes.